Summary: In the ever increasing focus on college-readiness, we can lose sight of connected learning, career-readiness and the joys inherent in making. This book review suggests that reading Matthew B. Crawford’s Shop Class as Soulcraft will provoke important discussion about out of school literacies, what counts as learning and the ways in which skilled, hands-on making requires critical thinking. Sometimes a book comes when you need it. Lately, it seems that when I have tried to discuss the ubiquitous NCLB legislation, I’m often at a loss for ways to articulate what the shift in emphasis away from critical thinking to high-stakes (primarily multiple choice) testing has cost students. 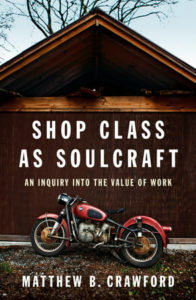 Now Matthew B. Crawford’s Shop Class as Soulcraft: An Inquiry into the Value of Work offers a wealth of arguments for educators advocating a focus on higher-order thinking skills. It’s a book that has already changed the way I define critical thinking, and its impact on my classroom practice began even as I finished the first chapter. Shop Class as Soulcraft provides a perceptive and provocative analysis of America’s movement away from a cultural mind-set that sees the work of skilled craftsmen and tradesmen as critical to building the nation. Crawford makes an impassioned plea for a return to educating students in “manual competence,” “the experience of making things and fixing things” (italics the author’s). This kind of “experience,” however, is an endangered species. By doing away with classes like shop, where the effects of a “mistake” are immediate and tangible and critical thinking underlies each decision made, Crawford contends, we have denied our children the opportunity to make and learn from their own mistakes. The result? Students and their teachers too often construe the mistakes necessary for learning as “failure,” and refuse to risk them. Crawford’s own résumé provides the ideal background for the argument he makes. He fluently speaks both the argot of the academic and the language of the mechanic. Author/mechanic Matthew Crawford defends trade work as more cognitively stimulating than society recognizes. This perspective has led him to understand that there is a philosophical—even, perhaps, moral—element to providing students traditional shop courses. It isn’t simply a matter of familiarizing students with tools, or even offering them access through industrial arts classes to those jobs which haven’t been outsourced (as Crawford notes wryly, you can’t outsource your car repair, or your house building). It is a matter of allowing students to experience the work done by tradespeople, which involves making numerous critical decisions on the job. Issues of class blur and even dissolve as students are drawn into the seductive world of tools, machines, and quality craftsmanship. To build an engine is to know the materials worked with, be familiar with metal stresses and tools, and juggle each a hundred times during the course of a day’s work. Crawford contends that a specific kind of necessary reflection—even metacognition—takes place in a machine class. He highlights the critical choices necessary in skilled manual labor, listing how “craft knowledge has entailed knowledge of the ‘ways’ of one’s materials . . . knowledge of their nature, acquired through disciplined perception.” (21) Detailing the qualities of wood (load bearing, water holding, stability under changing weather conditions, even resistance to rot) as well as of the carpenter’s tools—right angle, plumb line, level—he makes the point that carpentry alone is rife with critical thinking, evaluation, and decision making. From chapter 1, where he lays out “A Brief Case for the Useful Arts,” through his discussion of “The Separation of Thinking from Doing,” with its scathing indictment of the ways in which American business intentionally shifted the cognitive elements of skilled labor to the management class, to his complex analysis of education in “The Contradictions of the Cubicle,” Crawford tackles the underpinnings of a system that says “work” is not valuable when it deals with the material, only when it addresses the abstract. The value of his own work is that it speaks to the dearth of hands-on, trades-derived classes on so many levels. Crawford recounts the famous anecdote in which Heidegger notes that we come to know a hammer not by looking at it but by using it. Otherwise we end up not with real knowledge of a thing, but instead with a kind of intellectualized concept of what the thing might be. He cites a study in which students are asked to fold origami projects according to computer-generated directions. Although the computers have been programmed with all the necessary information, the pieces the students create are often theoretically correct, yet not recognizable as origami. Creating the hands-on classroom environment that Crawford advocates remains a challenge for most educators. I’d like to think that I work hard to make my classes relevant, active, and hands-on as much as possible. But a writing classroom—especially a required one—isn’t most students’ idea of fun. And the points Crawford makes about critical thinking, and how it informs most skilled hand work, have encouraged me to tie classroom practice more overtly to what my students do. Ours is a land-grant college: many if not most of my students have farming and rural roots. I’m working harder to incorporate “doing,” as Crawford would say. What then should we as teachers do? Crawford’s final chapter has a compelling story that serves as a kind of parable of action: Overwhelmed by a trip to India, he is feeling culturally alienated and at odds with his entire environment. To the side he notices a couple of electricians performing a task familiar to him: pulling wire through conduit. Immediately, he says, he is connected. The familiarity of the work, even in the alien environment, provides him with entrée into this new world. This, he pleads, is what we need to offer our students. Real work that real people around the world perform in their daily lives. As a writer, I’m not certain how I can translate writing into wire and conduit. But I am trying hard, thanks to Crawford’s work, to help both my students and the administrators and politicians with whom I come in contact understand what we have traded for the mess of pottage that is standardized testing. Do we need accountability? Absolutely. But surely we can find a better way to hold ourselves accountable than cutting out those very classes that help connect our students—and us—to the real world around us. Crawford isn’t a fast read. Nor will he provide easy answers to the many hard questions that face us as educators today. What he does do is provide a rich and eloquent voice for another perspective. And that’s a very strong start to a fuller conversation.